I have Mondays off, so I spend a lot of them with B. at the playground. We have two regulars — the little playground by the school about four blocks away, and the big playground at the park by the Mississippi, which we have to drive to. Either one is fine by B. He just wants to play outside. Last night I finally got him to sleep by promising that when he got up he could go to the playground, and he sure remembered — he was up at six and began peppering me with playground questions as soon as he was out of the crib. 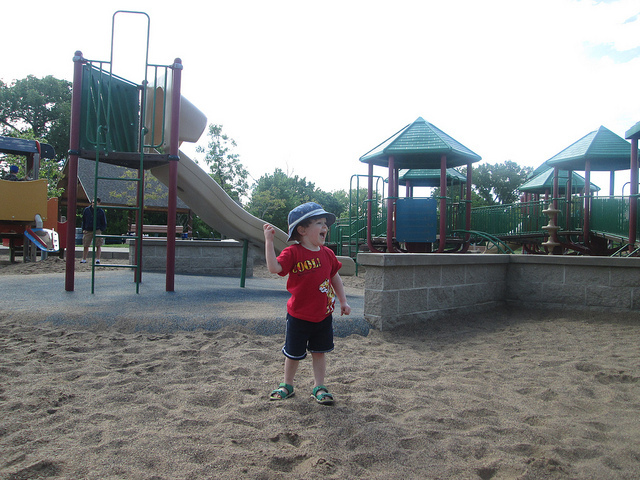 I made him wait until the sun peeked out of the clouds before we packed up the wagon and walked to little playground. He chose that one himself, because he has started to see some of the same kids and even more than the sand he can push around with his bulldozer and scoop up with his digger, even more than the swings and slides, Byron’s favorite part of the playground is other kids. B. will pull any other kid into his little world. Even older kids want to play with him. He’s not a ringleader, just a magnet. It’s amazing to watch him. Today he had seven kids joining him in “playing trucks.” I don’t know how two introverts got such an outgoing kid. To a certain adult who is young at heart and/or deeply disturbed, playgrounds are probably a wonderful display of young spirits mastering new skills both physical and social. But to me, they are boring places in which time passes like a snail across a field of paste. Oh, I enjoy watching Byron play and make friends, but every five minutes drags on like an hour. Even the occasional panic when the kid briefly disappears behind some playground equipment isn’t that thrilling. I expect it’s the same for other parents. We engage in small talk, which is always about the kids and never about ourselves (we trade THEIR names and ages like people at cocktail parties say their own names and what they do for a living). At the end of today’s play, Byron must have been as exhausted by the mingling as I was, because it was a rare time when he left willingly. When we got home, he ate some peanut butter bread, asked me to play “Day O” (his favorite song) on the guitar, and then went eagerly and early to his nap. He’s snoozing in there now, probably dreaming of a second round of playground time when he wakes up. I could handle the playground, but the swimming pool was a killer. I can still remember my joy when they were competent enough for me to climb into a beach chair and glance up between chapters of a novel.